Sony A6000 vs Olympus E-M10 Mark II, lot of difference present among the Sony A6000 and E-M10 Mark II. The Sony A6000 features APS-C size Hybrid CMOS sensor on the other hand the Olympus E-M10 II have a 4/3 size sensor, we don’t have a doubt that Sony A6000 will going to perform theoretically. 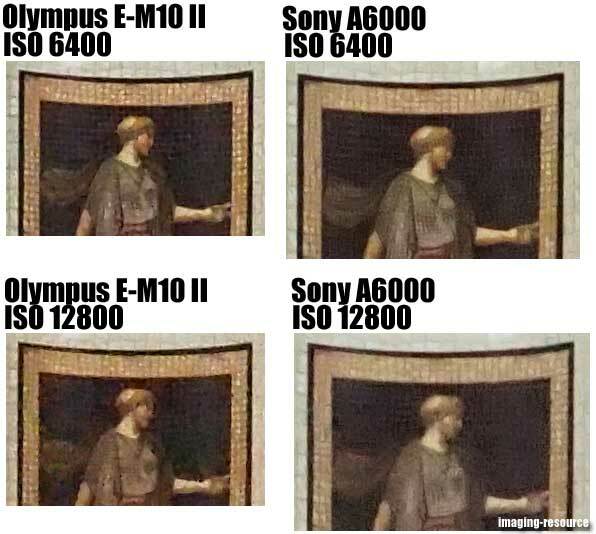 The Olympus E-M10 showing bit more details compared to A6000 whereas the Sony A6000 show less noise with more flat image, Sony may be implemented a strong noise reduction filter algo. Both camera image is usable upto 6400 only. Left ones are the winners. Also I Can’t see less noise on the right.